The Red Sox star gets 28 of 30 first-place votes, and Milwaukee's Christian Yelich receives 29 of 30 votes for the NL award. 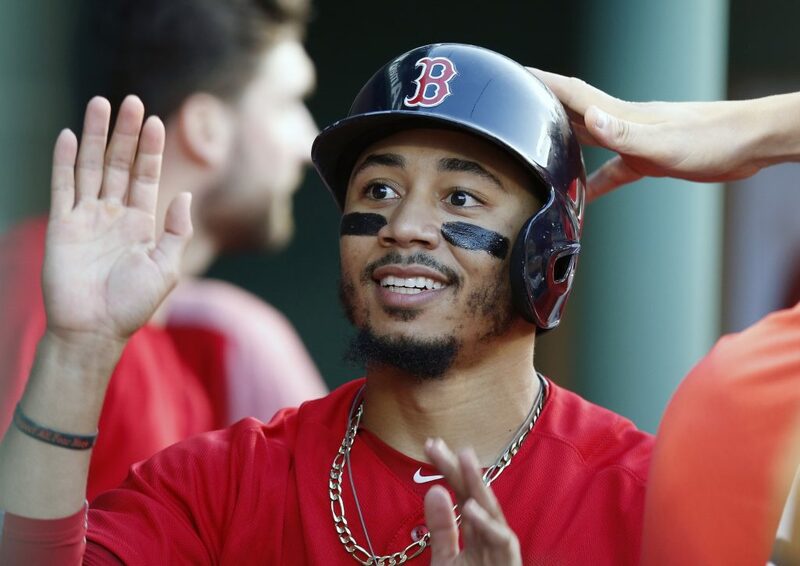 NEW YORK — Mookie Betts is ready to become an ambassador for baseball, now that he’s won a batting title, a World Series title and a Most Valuable Player award. “I enjoy being kind of a face around the game. I’ve kind of used this pedestal, or whatever you want to say, to spread knowledge that the game is fun,” he said Thursday after his runaway victory for the American League MVP award. Yelich is signed through 2021, and his deal includes a team option for the following season. Betts didn’t want to speculate whether he would be a Red Sox lifer, like former Boston MVPs Ted Williams, Carl Yastrzemski and Jim Rice. Betts can become a free agent after the 2020 season. “Right now, I’m just focusing on the 2019 season coming up,” he said. Betts received 28 of 30 first-place votes and 410 points from the Baseball Writers’ Association of America. Los Angeles Angels outfielder Mike Trout, a two-time MVP, followed with one first-place vote and 265 points. Trout tied the record of four second-place finishes shared by Stan Musial, Williams and Albert Pujols. Trout won in 2014 and 2016, finished second in 2012, 2013 and 2015, and was fourth in 2017. Cleveland third baseman Jose Ramirez was third with 208 points, and Red Sox designated hitter J.D. Martinez was next with one first-place vote and 198 points. Betts hit a major league-leading .346 with 32 homers, 80 RBI, 42 doubles and 30 stolen bases as the leadoff hitter for the Red Sox, who won a team-record 108 games and their fourth World Series title in 15 seasons. Votes were submitted before the postseason. Yelich got 29 first-place votes and 415 points. The other first-place vote went to New York Mets pitcher Jacob deGrom, the NL Cy Young Award winner, who finished fifth. Chicago Cubs infielder Javier Baez was second with 250 points, followed by Colorado third baseman Nolan Arenado with 203. Yelich won the first batting title in Brewers history with a .326 average. He set career highs with 36 homers and 110 RBI and had a 1.000 OPS. Yelich nearly became the NL’s first Triple Crown winner since Joe Medwick in 1937, finishing two homers shy of Arenado and one RBI behind Baez. Yelich was especially impressive in the second half, hitting .367 with 25 homers and 67 RBI – including 11 homers in August and 10 in September. Milwaukee reached the playoffs for the first time in seven years, swept Colorado in the Division Series, then lost to the Los Angeles Dodgers in a seven-game League Championship Series, falling one win short of its first World Series appearance since 2002.